"One of the giant killers you read about." [make] them best suited for small- to medium-sized rooms." Features Small two-way design that uses a 1" tweeter and 6 1/2" woofer along with a crossover that's "quite substantial for such an inexpensive speaker"; "the warranty is impressive": five-year parts-and-labor, 30-day satisfaction guarantee, and a 60-day complete-replacement warranty. Use "The CBM-170s are short speakers, so they need rather high stands -- Ascend recommends 28" to 31" in height"; Doug used Blu-Tack to couple the speakers to the stands and "damp [the speakers] a bit." Value "For $328 per pair, the CBM-170 is nothing short of a steal." It takes guts to compete in the budget-priced speaker market. First of all, making a really good inexpensive loudspeaker is tough -- really tough. Theres not the luxury of throwing every resource you can at the task. Second, theres some heavy competition nowadays -- and some companies are producing champion budget speakers that are not only cleaning house at their retail prices, but laying waste to competitors' products costing much more. These products are true giant killers, and we reviewers love to point them out. But all the fierce competition doesnt seem to rattle the folks at the new Internet-direct company Ascend Acoustics. In fact, they appear to welcome it. Even facing a rigorous measurement process and the eventual audition in my listening room -- the same room that has housed some of the best two-way speakers you can buy -- the Ascend CBM-170 loudspeakers arrived fearlessly at my door. Its no secret that one of the things youre paying for with expensive loudspeakers is a fancy cabinet. In fact, when a two-way bookshelf-type speaker retails for more than $1000 per pair, you'd better see a real-wood veneer or some other exotic finish that exudes sophistication. 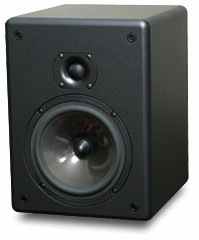 But you wont find that kind of finish on a speaker thats the price of the CBM-170: $328 USD per pair. It comes in a lightly textured vacuum-formed-vinyl finish thats good for keeping fingerprints masked and dust inconspicuous until it really builds up. The cabinet is a reasonable size --12"H x 9"W x 10"D -- and the speaker weighs in at 13 pounds. Ascend says that the cabinet is made of 5/8"-thick MDF all around. The edges and corners are rounded, which is visually attractive and more than likely adds to the sonic performance by reducing edge diffraction. Viewed from the front, the CBM-170 appears a little wider and shorter than most speakers -- rather squat in appearance. There are snap-on grilles for driver protection, but for serious listening (and our measurements) the grilles should come off. Despite the plain-Jane looks, the CBM-170's overall build quality is certainly nothing to complain about for the price. The CBM-170 is designed to have very linear on- and off-axis response, both on the horizontal and vertical planes -- the choice of the drivers and the work in the crossover have enormous effect on this. Attention to the off-axis performance is crucial because the sound you hear at the listening chair is a combination of the direct and reflected sound. Ascend also said that they could have had the CBM-170s deliver deeper bass, but it would have been at the expense of sensitivity. Instead, they wanted to keep the sensitivity pretty high and deliver enough bass so that the speaker could be used for music listening without a subwoofer. Ascend indicated that about half the customers are happy with the CBM-170s without subwoofer reinforcement; for the other half, Ascend has a very close relationship with Hsu Research and strongly recommends their subs. The CBM-170's 1" soft-dome tweeter uses a neodymium magnet. 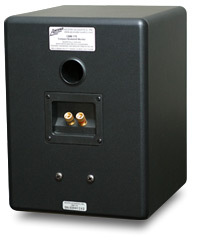 The woofer has a 6 1/2" Aerogel cone and is magnetically shielded, so you can use this speaker close to a television. Around back are the port, a single set of gold-plated-brass five-way binding posts, and threaded inserts for wall-mounting the speakers. The CBM-170's crossover is quite substantial for such an inexpensive speaker. Ascend says that the drivers are blended at 2.2kHz using second-order electrical filters on each driver. The electrical filter, combined with the drivers natural/mechanical roll-off, makes effectively for a fourth-order slope. In addition, the woofer has another second-order electrical filter above its main crossover point in order to get the woofer down in level even faster as frequency increases. Ascend says the -3dB point for bass is 69Hz -- reasonable for a speaker of this size -- and the sensitivity is 89dB. Average impedance is said to be a hair under 8 ohms. If true, the speaker is a pretty easy load for most amplifiers, and it has reasonable but not extraordinary bass extension. The warranty is impressive. Along with the customary five-year parts-and-labor warranty there is a 30-day satisfaction guarantee (you are going to buy the CBM-170 unheard because Ascend has no dealers), plus a 60-day complete-replacement warranty should a defect arise in the first 60 days of use. The CBM-170s were primarily used in two systems with only moderately powerful amplifiers. The first was a Zanden-based system with Model 5000 Mk II DAC and 30Wpc Model 600 tube-based integrated amplifier. The other system was pure solid state: Orpheus One DAC, Orpheus Two preamplifier, and 40Wpc Orpheus Three S stereo amplifier. In both cases, my Theta Data Basic transport spun CDs. Cabling was all by a new Canadian company called Maple Audio Works, except for the digital cable, which was i2Digitals X-60. Despite their modest power ratings, both the Zanden and Orpheus amps were easily able to drive the CBM-170s to more-than-sufficient SPLs, indicating to me that Ascends sensitivity spec must hit its mark. As my time wound down with the CBM-170s, I also auditioned them with the more affordable, 100Wpc Simaudio i-3 integrated amplifier. Before I go on, Ill touch on one critical part of bookshelf-sized speaker setup: the stands with which you use the speakers. The CBM-170s are short speakers, so they need rather high stands -- Ascend recommends 28" to 31" in height. I first tried stands as low as 24", and they worked fine with the CBM-170s -- one indicator that the speaker has good dispersion characteristics even on the vertical plane. But the speakers did seem to be rather low, as if I was always looking down to the speakers and the soundstage. So I recommend getting the CBM-170s up pretty high, as Ascend recommends. Finally, one little tweak you might want to try is Blu-Tack or a similar substance between the speaker and stand. The CBM-170s are reasonably heavy, but when I played them at high volume levels, I could feel them resonate a bit on my all-metal stands. Blu-Tack or a similar gooey substance gives the speakers a firm coupling to the stand, which seems to damp them a bit. The CBM-170s are smallish speakers with limited bass extension and output capabilities that make them best suited for small- to medium-sized rooms. No surprises here. But put aside the CBM-170s nonexistent low-bass region and peer into bass that they can reproduce and youll find that this speaker doesnt artificially boost those upper-bass frequencies to give the "impression" that theres deep bass when there is not. The bass the CBM-170s can provide is controlled and smooth, and then it fades away gently, as it should. The 70Hz specification that Ascend claims sounds about right to me. The frequencies that the CBM-170s can produce, they produce well and in complete control. This is just one hint that they are exceedingly refined performers. Move into the upper bass through the midrange and highs and youll find a remarkably smooth, clean, and coloration-free sound -- so clean, in fact, that it can be compared to that of the excellent $500-per-pair Energy Connoisseur C-3 loudspeakers, which themselves can outdo many speakers costing much more. The C-3s bass goes deeper, but the rest of the spectrum is quite comparable. While the room ambience and the low kick of the drums were missing from the CBM-170s on "5 Days in May," the opening track from Blue Rodeo's Five Days in July (go figure) [Discovery 77013], the pristine rendering of the vocals, keyboards, and guitars werent a problem at all. In fact, they were so good I was downright startled. Jim Cuddys country-tinged voice was starkly placed in the mix and was as pure-sounding as Ive heard from speakers costing not only what the Energy C-3s do, but for quite a bit more. The accompanying instruments were played out with impressive fidelity -- scratch that, astonishing fidelity given that the CBM-170s cost just over 300 bucks. The CBM-170s midrange is bang-on, the highs are extended and clean, and the imaging is quite stunning. This isnt the kind of speaker that glosses over, warms up, or romanticizes the sound. Played within their limits, the CBM-170s sound extraordinarily natural and neutral; no one area of the frequency spectrum dominates another, and thats important for a speaker wearing the badge of "monitor," as the CBM-170 does -- and pretty darn amazing for what these speakers cost. Impressed with the soundstage precision and the high level of resolution, I immediately dug out Ani DiFrancos Up Up Up Up Up Up Up [Righteous Babe Records RBR13-D] and played "Everest." I wanted to find out if the subtle sounds in the recording venue were apparent, if the stage was stretched from here to there with width and depth, and also if DiFrancos voice was placed distinctly left in the stage but just inside and behind the speaker. And it was. All of it. My only real quibbles were simply the things I already mentioned: restraint in terms of ultimate output and, of course, missing low bass. I found the CBM-170s to be startlingly good in the near field. The drivers blend at close range so you can get the speakers way out from the walls and put them near the listening position. Set them up right and youll be immersed in a splendid array of sound. Plus, they dont need a whole lot of power to make them sing. With some speakers, you need serious power to drive them to any decent level. Spend the same amount of money on a lower-powered, higher-quality, better-sounding amplifier -- whether it uses tubes or solid-state circuitry -- and Ill wager that youll have sound quality that can lay waste to some pretty expensive systems. With the CBM-170s set up for nearfield listening, Norah Jones voice sounded amazingly good on "Turn Me On" (Come Away with Me [Blue Note 32088]). Her voice flew freely, devoid of boxy colorations, and with no spitty or sibilant quality. And it was obvious with this and other recordings that the midrange wasnt the only outstanding area; the tweeter is well behaved too. Strings, piano, and cymbals are clean and clear. Today for me the high-frequency champion in the budget-speaker realm is Energys C-3 with its very sweet and pure top end. Again, the CBM-170s are certainly comparable to this fine speaker, and both of these speakers are far more refined-sounding than their price indicates -- put em up against some pricey competitors and you may come away surprised! As a result, both the Energy and the Ascend speakers handle excruciatingly tough recordings with surprising ease. Wes Phillips glowing review of pianist Glenn Goulds A State of Wonder: The Complete Goldberg Variations 1955 & 1981 [Sony Classical 87703] at onhifi.com prompted me to rush out and buy the three-CD package. I dont regret the purchase. The first disc was recorded in 1955 and the second in 1981; the third is a combination of Gould being interviewed about the recordings with some musical outtakes mixed in. Piano, as most know, is a notoriously difficult instrument for speakers to reproduce. Through the CBM-170s, Goulds playing is clean, tight, and precise, his nimble fingers jumping from key to key and the CBM-170s keeping up easily with wonderful detail and clarity. The weight of the instrument and effortless dynamics on strong musical peaks werent there, but the accuracy was outstanding. Is there room for a subwoofer with these speakers? Yeah, undoubtedly a sub would help flesh out the bottom end, providing you get a good top-to-bottom blend when you add it in. But do you need it? No, not at all. The CBM-170s can soar without a sub. When you know how to coax the most out of a small speaker to make it sound "bigger" than it really is, you can end up with a level of sound quality people usually pay big bucks for. The CBM-107s are fleshed out just enough, and with their smooth and natural presentation, I can overlook what they can't pull off and revel in what they do so right. One of the best bookshelf-sized two-ways that you can buy is the Amphion argon2, whose price has risen to $1495 per pair in black or silver finish, $1675 if you want real-wood veneer. The argon2 is a Reviewers Choice 2002 winner and also recipient of the SoundStage! Best Product Debut for 2002 award. I consider it more or less a reference that can compete with some of the best two-ways no matter their cost. In other words, its really good. Comparatively, the argon2 can go deeper in the bass than the CBM-170 and it can play louder without strain -- but not all that much louder, and thats key (at 85dB sensitive, the argon2 is not nearly as sensitive as the CBM-170). The point is that even two-way bookshelf speakers that cost a whole lot still have the same limitations. Money cant solve everything, and speakers like the CBM-170 illustrate that design prowess is more important than money anyway. The CBM-170 is a first-rate performer that joins the ranks of budget-priced, super-achieving minimonitors that lay waste to a good number of lesser speakers at the same price -- and a whole lot more. It accomplishes this through no-nonsense design that eschews a fancy cabinet in favor of solid engineering and good parts quality to deliver sonic performance that far outweighs its price. If this same speaker were produced in a fancy cabinet, say, with a real-wood veneer and perhaps some other cosmetic touches, the folks at Ascend Acoustics could easily get away with selling it for $800 or $1000 per pair, and still offer respectable value. But what they've produced in the CBM-170 is perhaps an even greater achievement: a lot of speaker for a little money. For $328 per pair, the CBM-170 is nothing short of a steal, making it one of the giant killers you read about. Price: $328 USD per pair. Warranty: Five years parts and labor with 30-day satisfaction guarantee and 60-day complete-replacement guarantee in case of defects.